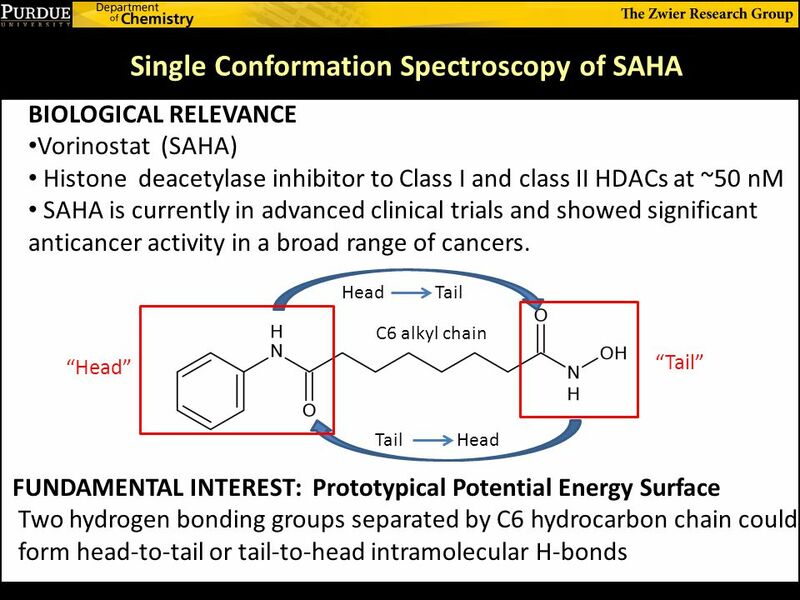 Single Conformation Spectroscopy of Suberoylanilide Hydroxamic Acid (SAHA): A Molecule bites its tail Di Zhang, Jacob C. Dean and Timothy S. Zwier Zwier. 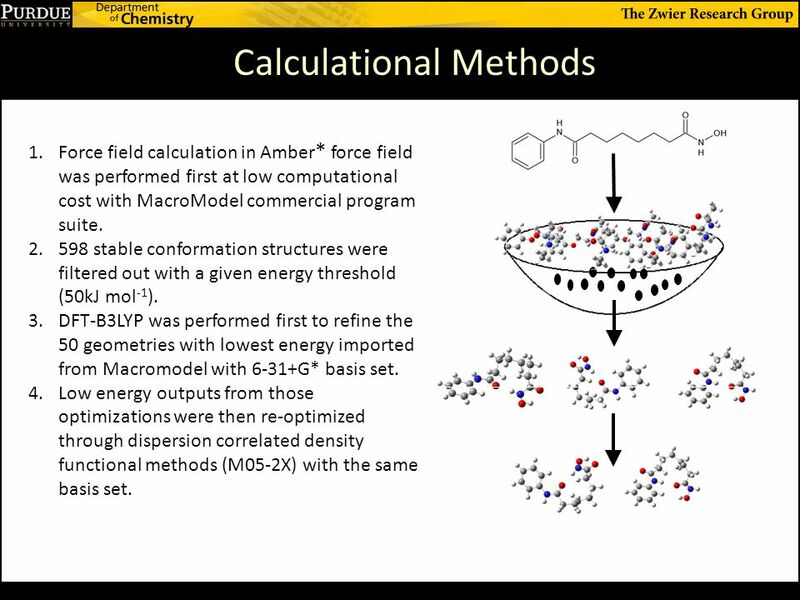 9 Calculational Methods 1.Force field calculation in Amber * force field was performed first at low computational cost with MacroModel commercial program suite. 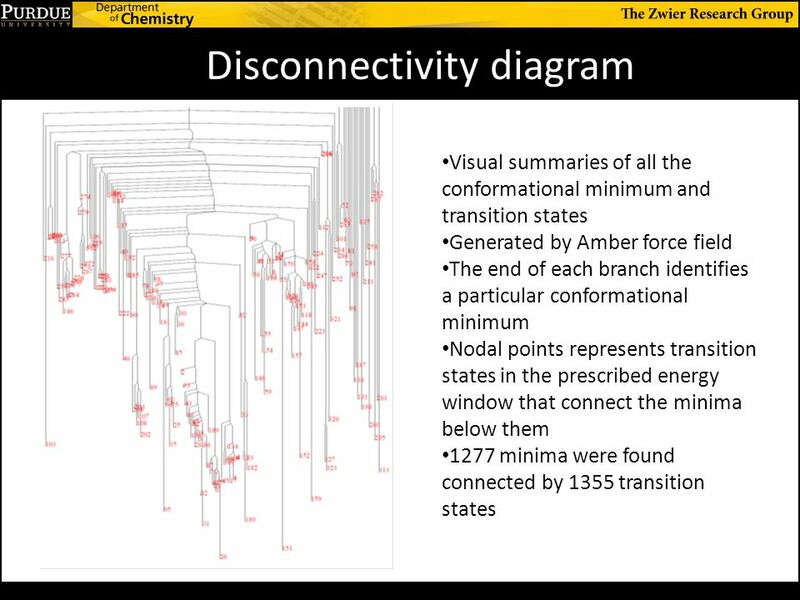 2.598 stable conformation structures were filtered out with a given energy threshold (50kJ mol -1 ). 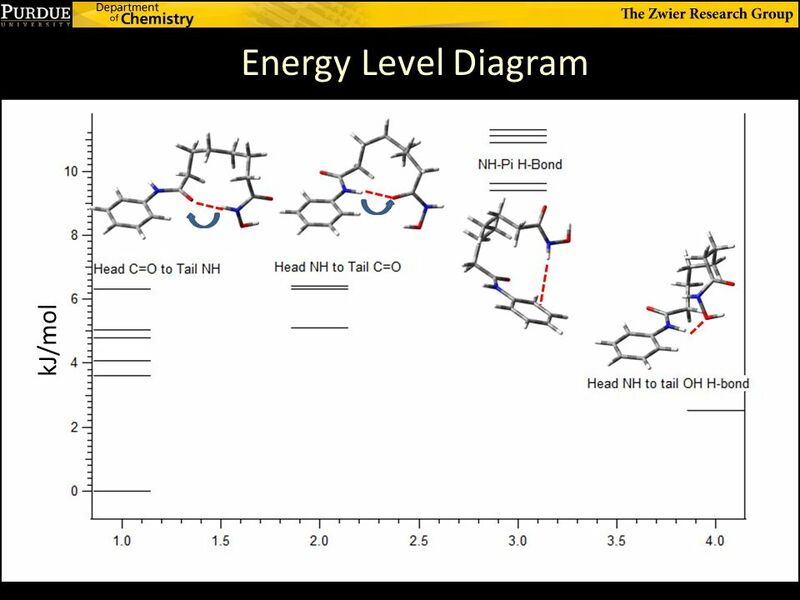 3.DFT-B3LYP was performed first to refine the 50 geometries with lowest energy imported from Macromodel with 6-31+G* basis set. 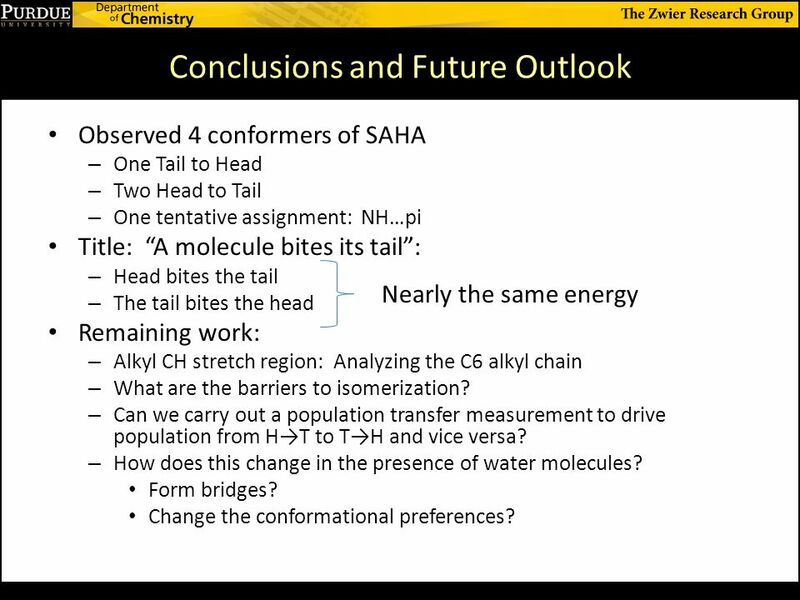 4.Low energy outputs from those optimizations were then re-optimized through dispersion correlated density functional methods (M05-2X) with the same basis set. 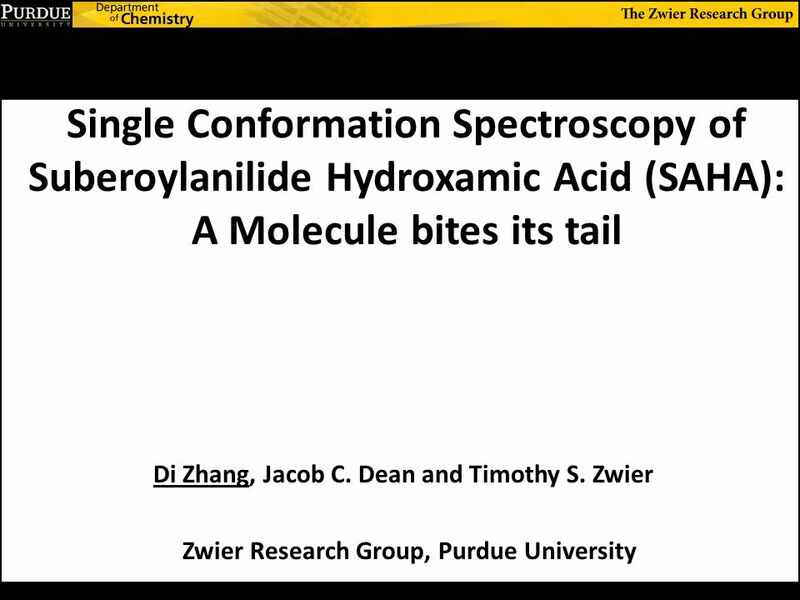 Download ppt "Single Conformation Spectroscopy of Suberoylanilide Hydroxamic Acid (SAHA): A Molecule bites its tail Di Zhang, Jacob C. Dean and Timothy S. Zwier Zwier." 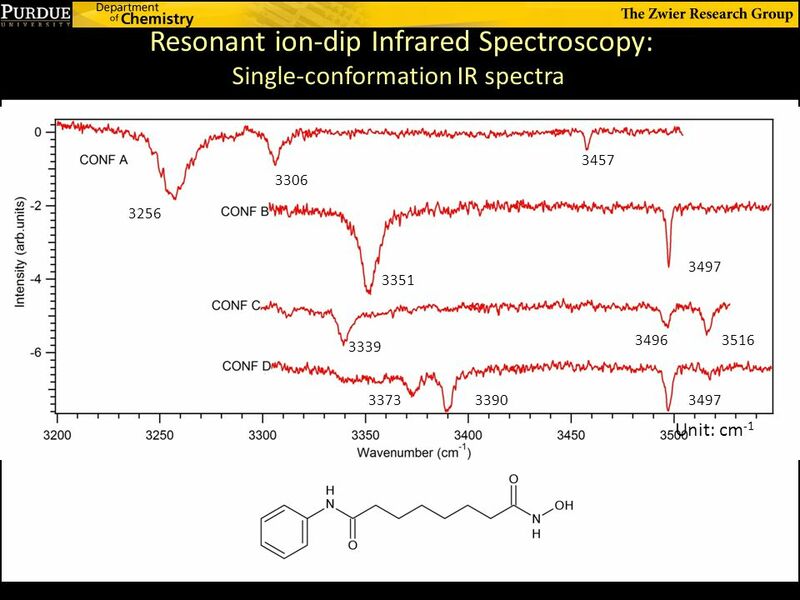 RESONANCE ENHANCED MULTIPHOTON IONIZATION (REMPI) SPECTROSCOPY OF WEAKLY BOUND COMPLEXES Lloyd Muzangwa Molecular Spectroscopy and Dynamics Group 67 th. Infrared Spectroscopy A.Why are we doing this experiment? 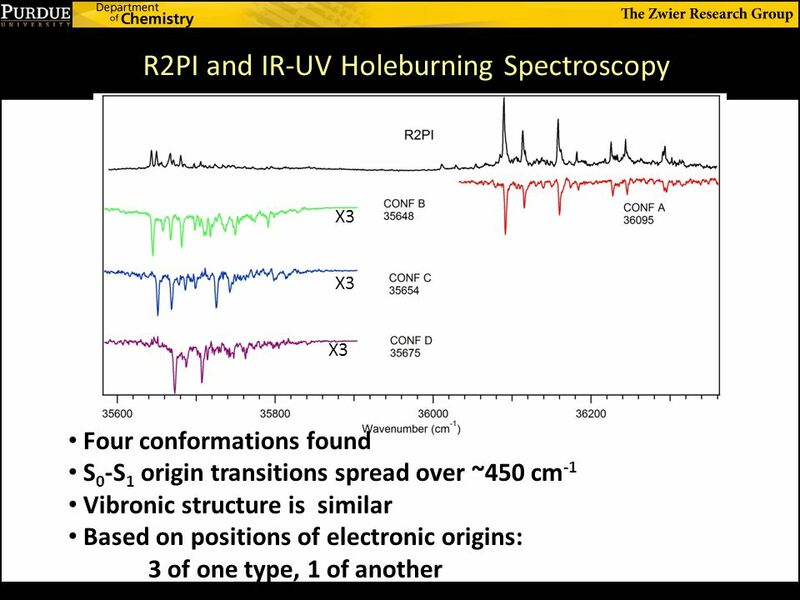 1)Infrared spectra tell us only a limited amount about a transition metal complex 2)In very simple. 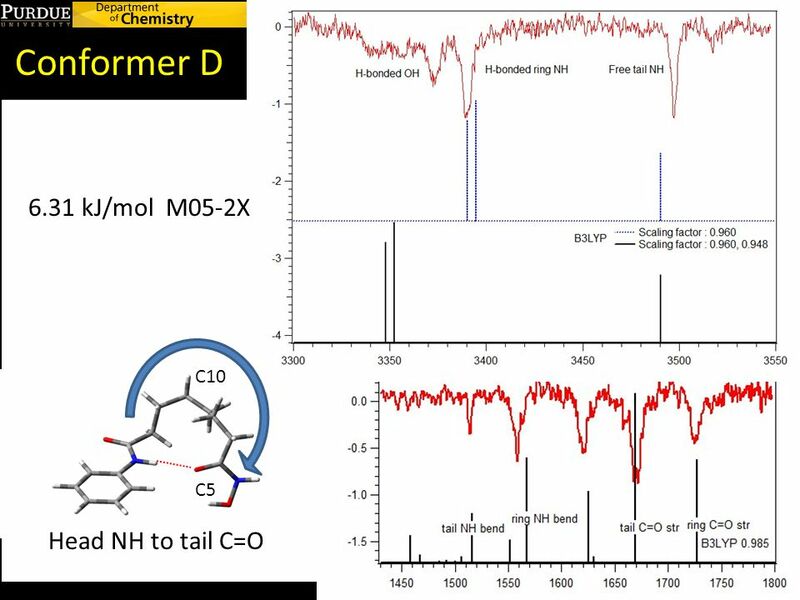 Single-Conformation Spectroscopy of a Diastereomeric Lignin Monomer: Exploring the Hydrogen Bonding Architectures in a Triol Chain Jacob C. Dean, Evan. 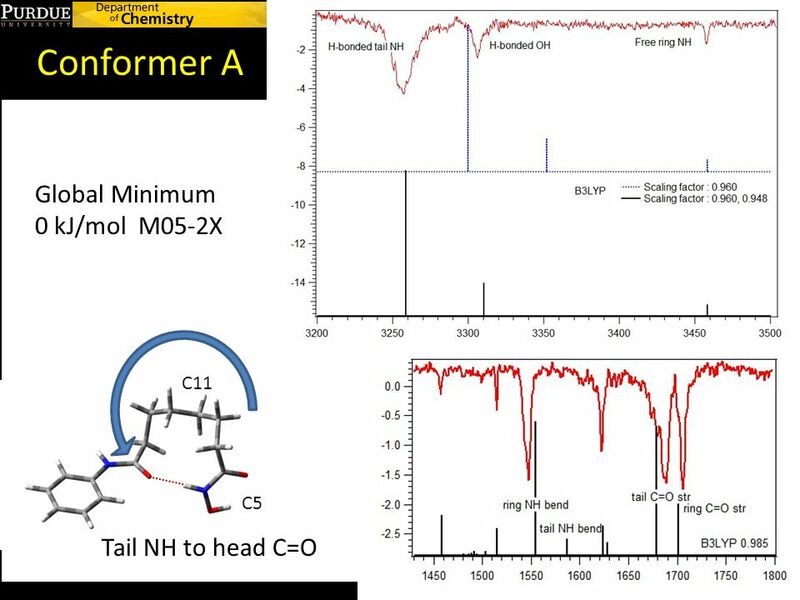 Conformational isomerization of bis-(4-hydroxyphenyl)methane in a supersonic jet expansion. 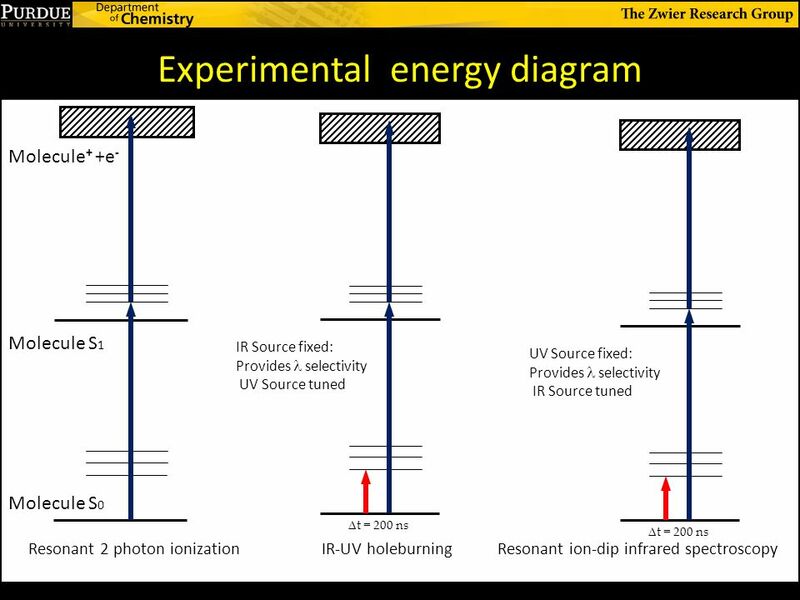 Part II: Internal mixing and low barrier potential energy surface. 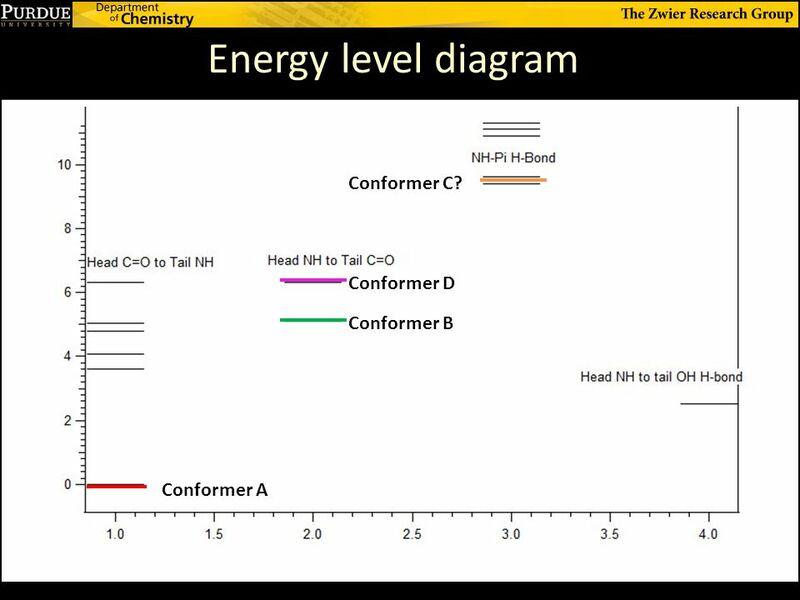 Condensed phase vs. Isolated gas phase spectra Solution phase A A A A A A W W W W W WW W W W W W W W W W W W: water A: sample ( nm) ( nm) Isolated. The ultraviolet spectroscopy of phenylcyclopentene and phenylcyclopentadiene. 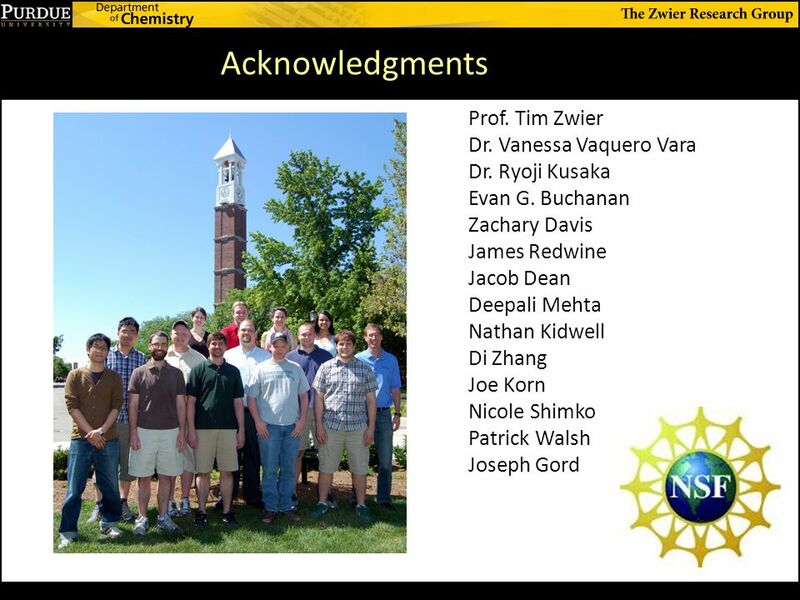 Josh J. Newby, Ching-Ping Liu, Christian Müller and Timothy S. Zwier FD02. Stimulated Raman scattering If high enough powered radiation is incident on the molecule, stimulated Anti-Stokes radiation can be generated. The occurrence. 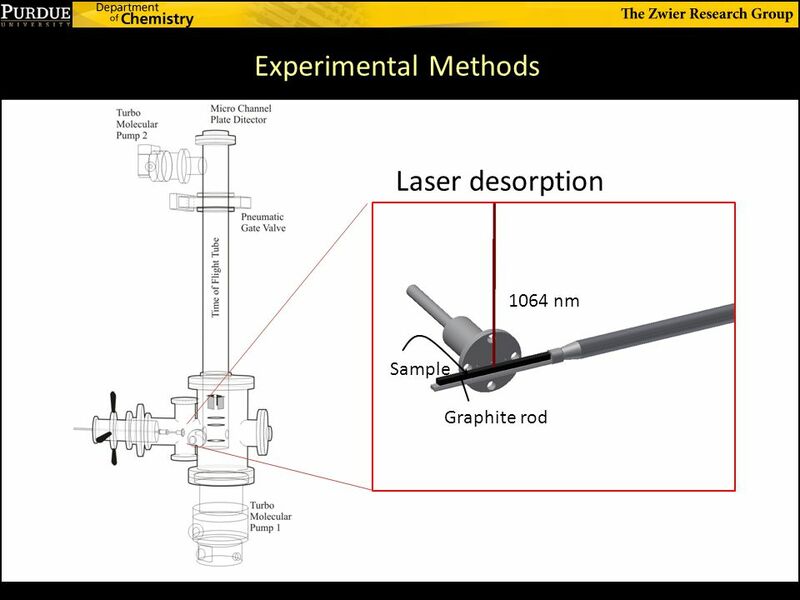 Laser Induced Fluorescence Structural information about the ground and excited states of molecules. Excitation experiments  Excited state information. 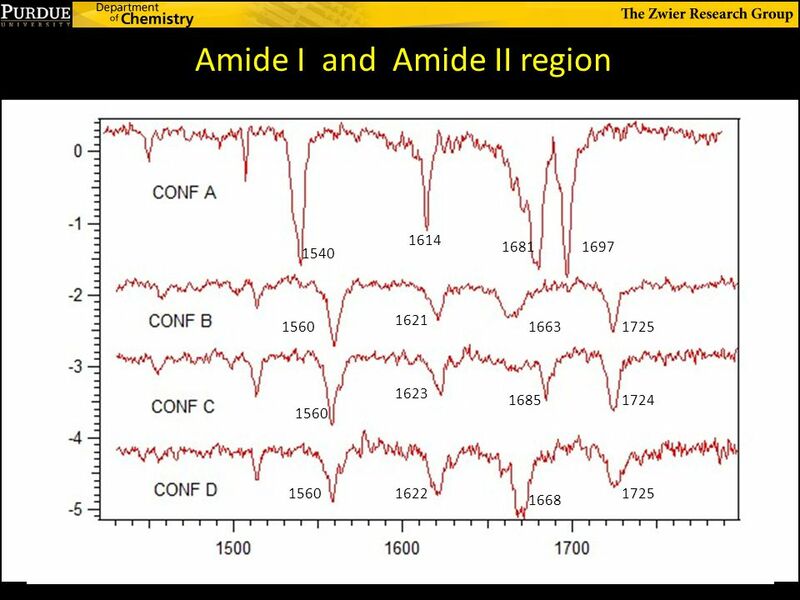 Vibronic Spectroscopy of Jet-Cooled 1,4-Phenylene Diisocyanide 6/21/11 1 DEEPALI N. MEHTA, ANNA K. GUTBERLET, AND TIMOTHY S. ZWIER 66 th International. 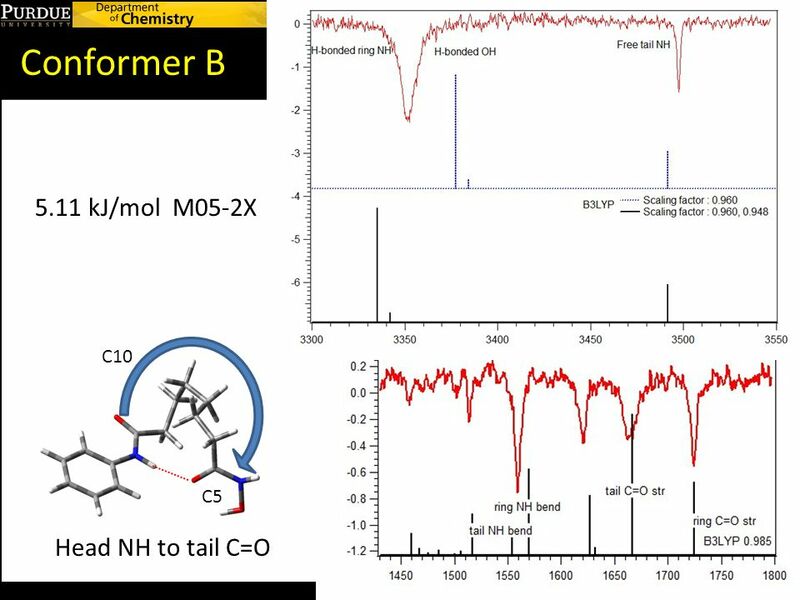 Spectroscopic Investigation of o-, m-, and p-Cyanostyrenes International Symposium for Molecular Spectroscopy FE-12 Joseph A. Korn †, Stephanie N. Knezz. 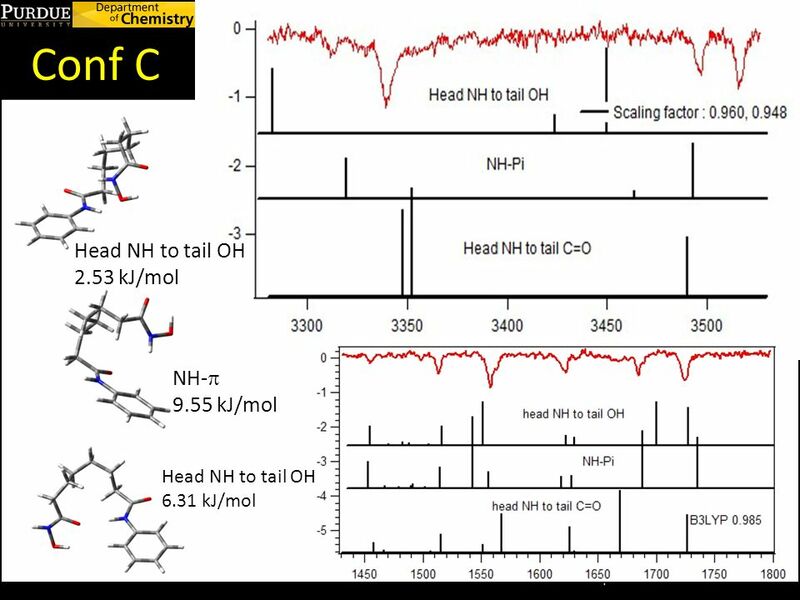 VIBRONIC SPECTROSCOPY OF THE PHENYLCYANOMETHYL RADICAL 6/23/11 1 DEEPALI N. MEHTA, NATHANAEL M. KIDWELL, JOSEPH A. KORN, AND TIMOTHY S. ZWIER 66 th International. Theoretical Investigation of the M + –RG 2 (M = Alkaline Earth Metal; RG = Rare Gas) Complexes Adrian M. Gardner, Richard J. Plowright, Jack Graneek, Timothy.